No air conditioner? No ceiling fan? No problem. If you’re an elephant that is! These pachyderms pack their own portable cooling system. Their tool of choice is their trunk which they use to fling mud onto their bodies. 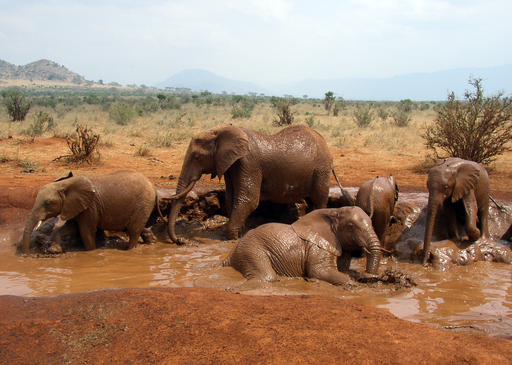 If a nice roomy mudbath is available, some will take a more efficient approach and wallow in it. The full-body mud-mask not only protects them from the sun and from insects, but cools the elephants down. Thermal images of Asian elephants by Canadian scientists visiting a zoo in Florida illustrate how the mud’s cooling properties last all day long and into the night. As you can see from the above photo, African elephants employ this same technique. A similar study was conducted at Busch Gardens in Tampa, Florida, by thermal biologists. The purpose of this study was to highlight the importance of providing elephants with shade and water during summer daylight hours. Apparently mud is to elephants what Freon is to shelter-dwelling humans.